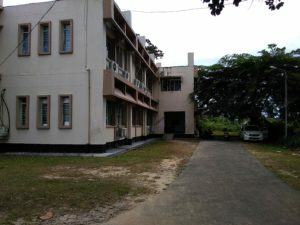 The Department of Biotechnology, Assam University, Silchar 788011, India offers MSc, MPhil, PhD and DSc programs in Biotechnology. The Master Degree program of the department was started in July 2004, and is of two-year duration. The Choice Based Credit System (CBCS) was adopted from July 2010 onwards. Core courses as well as advanced courses like Genetics, Molecular Biology, Biochemistry, Immunology, Microbiology, Bioinformatics, Genetic Engineering, Plant Biotechnology, Animal Biotechnology and Medical Biotechnology are covered. The MSc final semester students also undertake a short term research project towards completion of the program. Our main goal is to impart hands-on-practicals in six different laboratories, 1. Biochemistry 2. Animal Cell Biology and Immunology 3. Molecular Biology 4. Microbial Technology 5. Plant Biotechnology and 6. Bioinformatics and Genomics. The departmental faculties are actively involved in research in the broad areas of Molecular Biology, Cancer Biology, Plant Biotechnology, Immunology, DNA barcoding, Genomics, Genetics and Bioinformatics. Department has several research projects on cancer genomics, DNA barcoding, methanogenomics, molecular characterization of nitrogen fixing bacteria, plant biotechnology etc. The department is equipped with a small animal house, and state of the art equipments such as deep freezer (-20 & -80), gradient and personal thermal cycler, real time PCR equipment, gel documentation system, animal cell culture and plant tissue culture facilities, automated DNA sequencer etc. and much more. These facilities are available to MSc, MPhil and PhD students. Students actively participate in the seminars and workshops conducted at both university and national level. They are also encouraged to participate in co-curricular activities at university level. A good number of passed out students are now employed as teachers in colleges, universities and other educational institutes. Also many of the students have found placements in industrial and service organizations within and outside North East India.